During this landscape photography exercise – I used a compact system camera, a Sony A7 Mark II – Full Frame with a Sony A FE24-240mm F3.5-6.3 OSS Lens. For these photographs I used the camera on the tripod with a remote control. I also used my Apple iPhone 8 Plus mobile phone for quick spontaneous photographs and gain GPS location readings. A beautiful winter’s photography adventure day walking around the Kinglake National Park at Masons Falls, Kinglake West, Victoria – Australia! I had the wonderful opportunity to also enjoy the company of my daughter, granddaughter and husband. During our time here, we did the walk to the falls where from a large viewing platform, we were able to take a number of photographs. It was difficult to obtain varying shots with trees obscuring the overall view of the falls but it was a very beautiful outlook. Along the walk we found tall Black Wattle trees showing off their beautiful pom-pom like flowers. My daughter and I also managed to photograph Superb Fairy-Wren that were easily found hopping amongst the ground vegetation within the picnic area but not so easy to photograph as they move very quickly. During this landscape photography exercise – I used a compact system camera, a Sony A7 Mark II – Full Frame with a Sony A FE24-240mm F3.5-6.3 OSS Lens. For these photographs I used the camera both hand-held and on the tripod with a remote control. I also used my Apple iPhone 8 Plus mobile phone for quick spontaneous photographs and gain GPS location readings. The above photograph on the right features my daughter holding her Sony A7II camera with a lens – Sigma 150-600 contemporary suitable for capturing photographs of birds. Here we found small Splendid Fairy-Wrens hopping around looking for morsels of food visiting tourists had left behind after their visit to the Masons Falls. Below here is a lovely photograph of a female Superb Fairy-Wren which she managed to achieve. It has to be noted I wasn’t able to achieve the same result and my dear daughter has allowed me to show her photograph. These little creatures were just too fast for me! Some days are just best to stay indoors and Sunday 19thAugust was one of those days, especially if you are a keen photographer! We took a short morning drive on this day to see if there were any good landscape spots to photograph. Unfortunately, the predicted looming bad weather followed us and eventually after some hail, snow and rainfall, we decided to head back home and do our photography adventure – on a better day. I did manage to capture this photograph though (featured above) at a spot in Baynton, a small rural community, central Victoria – Australia and near the Bourke and Wills track. Here, the sheep had made their way up towards the top of the hill, after they had spotted our car pull-up beside their lush green grazing pasture. I managed to take this photograph seated within the car, through the passenger’s window as the weather conditions were just too dismal to be standing out in the elements! During this landscape photography exercise – I used a compact system camera, a Sony A7 Mark II – Full Frame with a Sony A FE24-240mm F3.5-6.3 OSS Lens. For this photograph – I used the camera hand-held as I took it from inside our car through the open car window. I also used my Apple iPhone 8 Plus mobile phone for quick spontaneous photographs and gain GPS location readings. On my return home, I downloaded and developed the photograph into Adobe Lightroom Classic CC. During the process of developing it I was able to see what I needed to address during my next photographic adventure. Being out-and-about experiencing the natural wonders of the world really does rejuvenate the body and soul – even if the weather is dreadful! Photography is just another way to improve one’s sense of wellbeing and at the same time – be creative! This photography adventure came out of a need for my dear hubby to get-out-of-the-house after spending almost four weeks bedridden due to a back injury. Now on the mend, he felt a desperate need to take a drive into the bush to do some forest bathing. As I had been his carer over this period of time, I too felt the same need! We decided to visit a region we had driven through before, but hadn’t stopped at called Mount Alexander Regional Park at Faraday, Victoria – Australia. Here we travelled to three locations, one called Dog Rocks and the other two – old historical Granite Quarries. At Dog Rocks, which is a short stroll off Joseph Young Drive, we discovered a conglomeration of ginormous granite rocks. Dog Rocks was named as such back in 1846 by the manager of Lockhart Morton of Sutton Grange Station as many dingoes were seen around the rocks during that period of time. Dog Rocks is a very picturesque location with native gum trees growing in mangled formations around these huge boulders. The late morning sunshine dappling its way through the bush helped make for interesting photographic opportunities. But the gale force winds presented me with a photographic challenge – that being to ensure my photographs didn’t experience any motion blur; with a high shutter speed and high ISO’s, mission accomplished! Small pockets of openings through the bush revealed expansive views of Harcourt farmlands which looked particularly green due to winter rains. We spent some time here photographing and just simply enjoying the beautiful, scenic surroundings. After leaving Dog Rocks, we drove a little further along and discovered another track leading off Joseph Young Drive which lead up to a historical granite quarry. Bathing in the late morning sun, we found monstrously huge chucks of granite, stacked around a large-scale quarry piece of machinery. Opposite the quarry site we found an area where stunning panoramic views looking out across towards Harcourt could be easily photographed. After our departure from this location we spotted another track which lead us to the opposite side of the mountain. Here we found a smaller granite quarry and once more panoramic views looking out across towards Sutton Grange. During this landscape photography exercise – I used a compact system camera, a Sony A7 Mark II – Full Frame with a Sony A FE24-240mm F3.5-6.3 OSS Lens. For these photographs I used the camera mostly hand-held due to the high shutter speed and high ISO camera settings. For the panoramic views I used low ISO’s and the camera mounted on a tripod with a remote. I also used my Apple iPhone 8 Plus mobile phone for quick spontaneous photographs and gain GPS location readings. 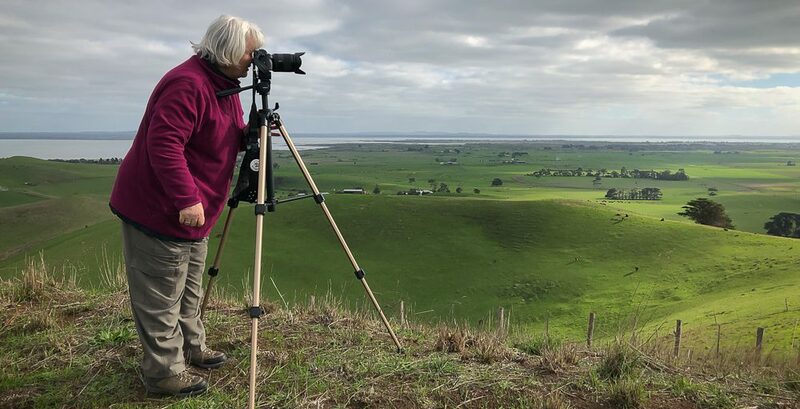 This particular photography adventure, back in July 2018, had us driving along the Mr Tarrengower Road heading up towards Mount Tarrengower Lookout, Maldon – Victoria (Australia). We stopped alongside of the road to take in panoramic views stretching across out over towards the farming plains of Tarrengower. The day was wildly windy where the weather one moment was sunny and the next thunderous clouds possessed the wide-open skies. Standing overlooking this vast area helped us appreciate once more, the stunning beauty of this region, especially during this time of the year where the land is green from winter rains.